Los Angeles, California (CNN) - The headlines have irritated and outraged veterans and service members and their families around the world. 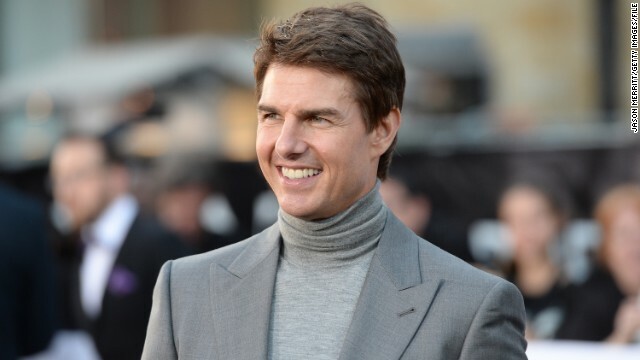 "Tom Cruise: making movies is like serving in Afghanistan," said one of the headlines buzzing around social media and patriotic websites this weekend. One problem: that's not quite what he said. I normally don't pay much attention to this kind of story, but on this Veterans Day weekend a lot of veterans and their families have expressed outrage to me about this quote. The comments originate from a deposition in Cruise's libel suit against Bauer Publishing, a magazine publisher, which he accuses of charging him with abandoning the daughter he had with Katie Holmes. Celebrity news site TMZ.com reported, "'Tom says his location shoots are just like serving a tour in Afghanistan." The website then quoted Cruise saying, "That's what it feels like. And certainly on this last movie, it was brutal. It was brutal." Reading the relevant excerpts of the deposition shows that Cruise's comments reveal a different story. Additionally, when the Bauer publishing group attorney first references Cruise's attorney as having brought up Afghanistan that is an apparent reference to a September 19, 2012 letter from Cruise's attorney Aaron J Moss. Moss took issue with a magazine headline referring to Cruise having broken a promise to attend his daughter's first day of school. "But the truth, as you know, is that Mr. Cruise is a devoted father, who simply happens to be working in London on film. By your reasoning, any actor who is shooting on location in a foreign country could be charged with child abandonment, as could all of the mothers and fathers serving overseas in the military." The comments come in a section of the deposition where Cruise is being asked about time he has spent away from daughter Suri, either because of film or other commitments. "Now your counsel has publicly equated your absence from Suri for these extended periods of time as being analogous to someone fighting in Afghanistan," opposing counsel asks him. "Are you aware of that?" "I didn't hear the Afghanistan," Cruise replies. "That's what it feels like and certainly on this last movie it was brutal. it was brutal." "Do you believe that the situations are the same?" Cruise is asked. "Oh come on," Cruise says, "you know, we're making a movie." Cruise's attorney, Bert Fields, tells CNN in a statement, "Headlines stating he equated his job with those in the military are demonstrably false. They are a distortion of what is provable and on the record." "Tom is a staunch supporter of our troops and does not feel that making a movie is even remotely comparable to fighting in Afghanistan and said so in plain English," Fields said. Certainly being away from your child because you're a movie star on location cannot be compared to the absence a soldier in a war zone might feel for a child, not knowing whether the surrounding dangers might mean he or she never sees the child again - though depths of emotion are difficult to debate. But in the deposition, Cruise quite clearly suggests he does not think making a movie is the same as fighting a war.